With great spectrum holdings come great responsibilities, and nobody knows this better than US carriers that pay billions upon billions on federal auctions for the precious radio frequencies. If you have been curious which of the existing LTE bands of Verizon, AT&T, T-Mobile, or Sprint are seeing the most data traffic on average, research firm Tutella has it tested out for you in partnership with FierceWireless. As you can see from the maps and charts below, America's largest carrier Verizon has its LTE data load heavily skewed towards the 1700MHz band on average while the 700MHz spectrum is seeing the most rural action. 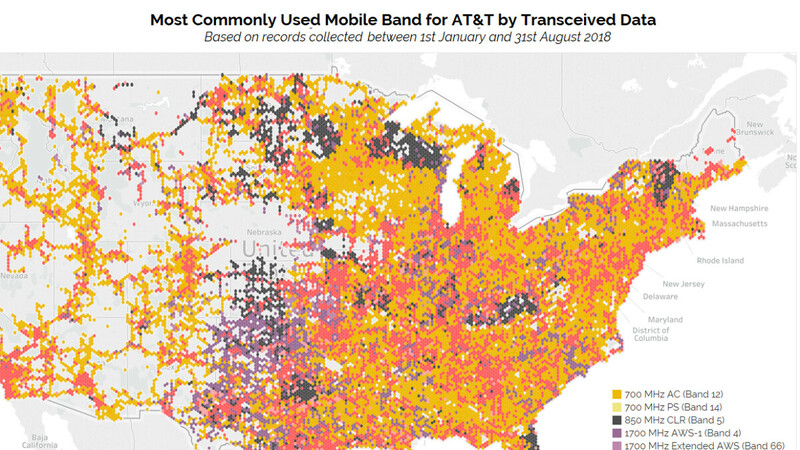 That is also the extra-urban case for AT&T but its most trafficked data frequency on average is the 1900MHz band. T-Mobile, however, has gobs of 600MHz spectrum to take advantage of, and at some point, it certainly will but for now, it's the 1900MHz one that rules supreme there, even in non-urban locales. That's Sprint's rural king as well, with a little help from the 850MHz band. The extra-urban future may be low-band, but the mids still carry the vast majority of American mobile data traffic on all major carriers and will continue to do so for the foreseeable future.